I should have given instructions to the girl before I handed her my flogger, but I guess I forget that using a flogger isn’t an automatic motion for some people. You start out with soft, even strokes on one side and then the other, in a rhythm. Little by little, you build up how much force you use. So, as you swing the flogger and connect, each time is just a big harder than the last. You shouldn’t grab the ends and snap a flogger at first. You can build up to that if your sub has agreed to something like that. But most subs who like floggers have told me that they like them because it’s more about sensation than about pain. If you snap them, then it hurts much more. Also, if you do it with the right kind of flogger, you can break skin. I am not saying it’s always bad to break skin, by the way. Some people like that. However, the amount of people who like it is very small, and therefore it’s not something that you want to do without talking about it in detail with your sub first. Remember to cover such things in scene negotiation before you play! For me personally, I will not break skin or leave marks without making sure I have a signed consent form. I may have broken this rule with one of two relationships I have had with men, but I never break it with women because some accusations can ruin your life. Anyway the point is; this girl I was with just started flailing the flogger around wildly, with no control at all. She missed the guy entirely once or twice and hit the walls instead. Then, in an attempt to control the flogger, she started grabbing the ends of the tails to snap it. That, of course, resulted in an angry submissive who wasn’t okay with such intense pain; particularly when it came with no warm up at all. I took the flogger from her and tried to show her what she was doing wrong, but maybe that is something best practiced in private on a pillow, before trying to hit a real person. 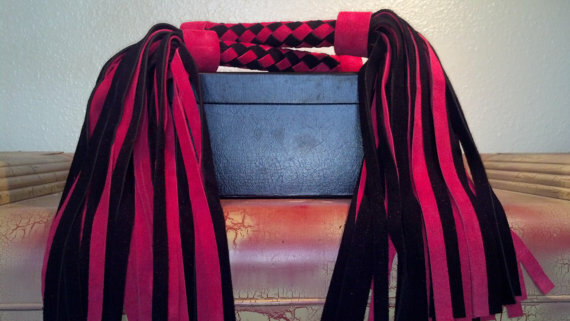 I learned to handle a flogger so long ago that I honestly can’t remember if I started on a person or not. I would guess not though, since I know my first encounter with a flogger was at Madam Tracy’s, and I assume she would have had me practice the figure-eight motion before there was a submissive in the room. The point is; always talk first with the person who plans to get hit about what their expectations are. If they say that they do not know, it is best to give them a simple system of green-for-go, yellow-for-uncomfortable, and red-for-stop. Then start with a figure-eight motion and hit them softly, allowing the sensation of the flogger to be all that they feel. Slowly build to hitting harder and harder, so that it will start to sting over time. Vary where you hit, so as not to just attack one spot over and over. And of course, don’t snap it unless you know they are okay with possible permanent damage to their skin.